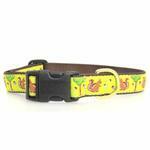 You and your dog will go Nuts for these squirrels on the Nuts Dog Collar by Up Country! Take a walk in the park and always see squirrels with the Nuts Dog Collar. This collar is made from high-tensile strength nylon webbing with sewn on polyester/nylon ribbon. This collar is stain and fray resistant and stand up to heavy wear! The adjustable collar hardware consists of a cast solid brass D-ring and a plastic quick-snap buckle. This great dog collar is machine washable and made in the USA! 10" Teacup: 10" Length x 1/2" Wide under 10lbs. 12" Teacup: 12" Length x 1/2" Wide under 10lbs. 14" Teacup: 14" Length x 1/2" Wide under 10lbs. Posted On 07/14/17 by Pam G from Campbellsport, WI Yes, Pam G recommends this product! Colors are bright and fun. Love Up Country collars! Posted On 06/09/16 by Camille S from Chattanooga , TN Yes, Camille S recommends this product! You'll be nuts over this collar. Well made and fun. Posted On 04/05/16 by Camille S from Chattanooga , TN Yes, Camille S recommends this product! Up Country makes such fun designs for every season and occasion. I have a collar for every month, birthday, 4th of July. Can hardly wait for the gobbler turkey collar to become available. Up Country's products are so well made and the sales BaxterBoo run, are irresitable. My husband smiles as he informs me another package from BaxterBoo has arrived. Posted On 08/05/15 by Lisa L from , Yes, Lisa L recommends this product! Posted On 06/04/15 by Clarissa S from Los Angeles, CA Yes, Clarissa S recommends this product! Posted On 10/25/14 by Melissa W from St. Paul, MN Yes, Melissa W recommends this product! My dog loves watching and chasing squirrels, so this was a no brainer. I was very happy with the speedy delivery. Posted On 11/13/13 by cathy s from haverhill, MA Yes, cathy s recommends this product! I love it. It is absolutely adorable. The collar is constantly getting washed because Daisy gets it filthy playing at the dog park. It has several washings with fading,or shrinking. and as usual a very affordable price. Excellent quality. Posted On 11/09/13 by Elaine T from , Yes, Elaine T recommends this product! Fun design. A little thinner than I imagined. Fits well. This is one of the best sites I've used to purchase stuff for Barry White, my precious IG!